Tuesday 18th October – the guys who manufactured our fresh water pump in Italy flew in from Milan and drove all the way from Lisbon to Lagos – they certainly needed an espresso when they arrived at 3pm (not sure if my Nespresso machine was up to the job but they drank it anyhow). 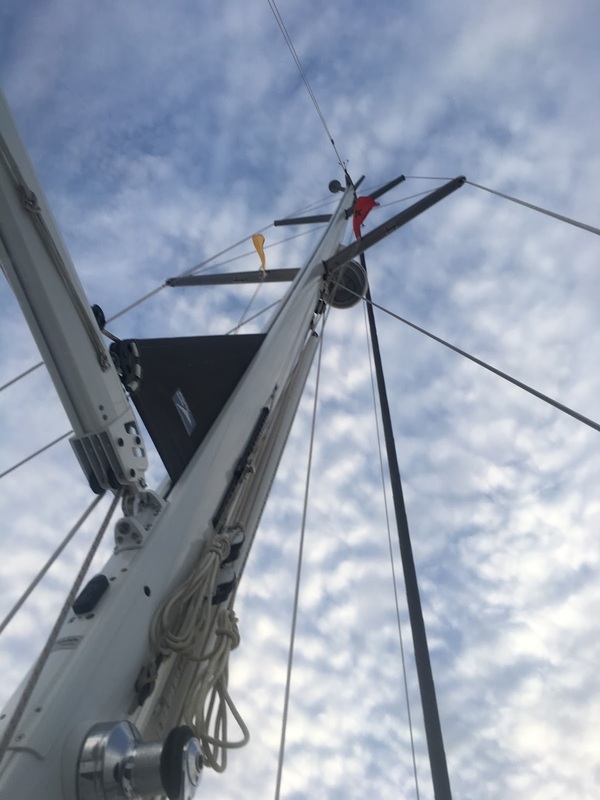 We seriously could not believe they would make this trip for a pump, however we had been through 3 of their pumps and they are so passionate about this pump they wanted to come and check out our whole system for themselves; I think they are also keen to keep their relationship with Oyster…. It was actually the owner of the company and the sales director who came, the owner then stripped down to his vest to fit our new pump and make all the adjustments. All done, Andrew invited Jac from Surya (Oyster 575) to join the gents for a beer; as Jac also had a few questions – so the poor guys ended up on his boat too. We saw them leaving the marina about 6pm looking a bit jaded for their drive back to Lisbon - but two happy Oyster owners with fully functioning Marco pumps. Having been based in or near Lagos for nearly two months now (we arrived on 20th August) Andrew and I were desperate to get on the move. So after our lovely Italian chaps left we brought in the latest weather forecast, paid up at the marina farewelled our Lagos family and set about readying Askari for an early morning departure. Just a word on the fabulous people we met in Lagos, especially Cliff and Val, Rob and Lynda, Jac and Renata, Joe and Faith, Augustus and Nick, most of whom are wintering in Lagos but made us feel like part of the place even though they knew we planned to leave - I really appreciate this as often in Australia it can be hard to make friends when people think you are a transient – although my liver is benefitting from a break in the partying I’m sure. 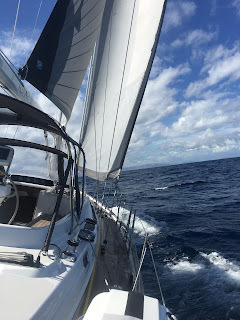 So to the trip - Our plan had always been to go to Madeira, however the weather window was at least another week away as a big low was heading across the Atlantic so we had two choices – South or East. 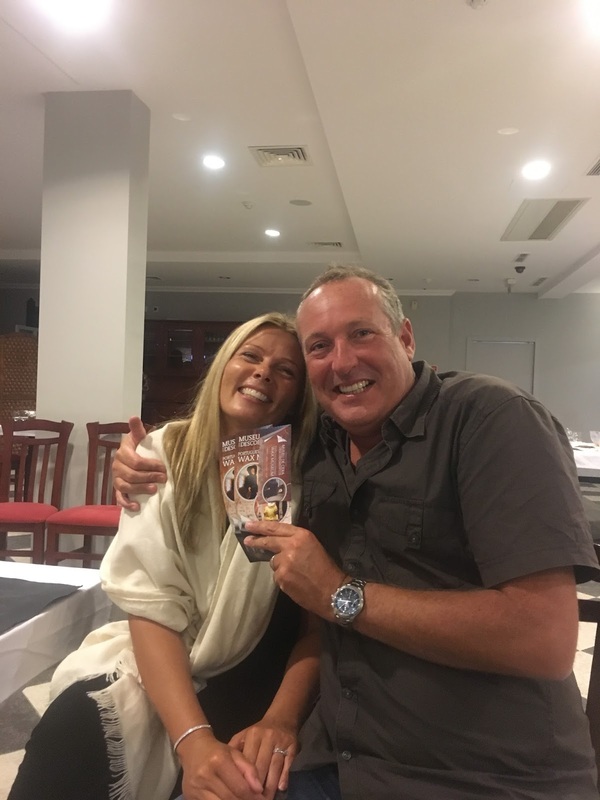 I thought we might need a bit of culture and a real change of scene after so much time in the Algarve and after challenging Andrew’s ‘the conservative thing to do’ approach we decided to head to Rabat in Morrocco – just over 200 miles which meant we should be there the next day…. Unfortunately the Marina at Lagos is behind a bridge, which at this time of year wouldn’t open until 9am, so our departure wasn’t as early as we would have liked but the AWOL crew helped with our lines to get us out of a particularly tight marina berth and gave us a farewell card – we’ll miss them. Then by 9.30am we were well on our way. 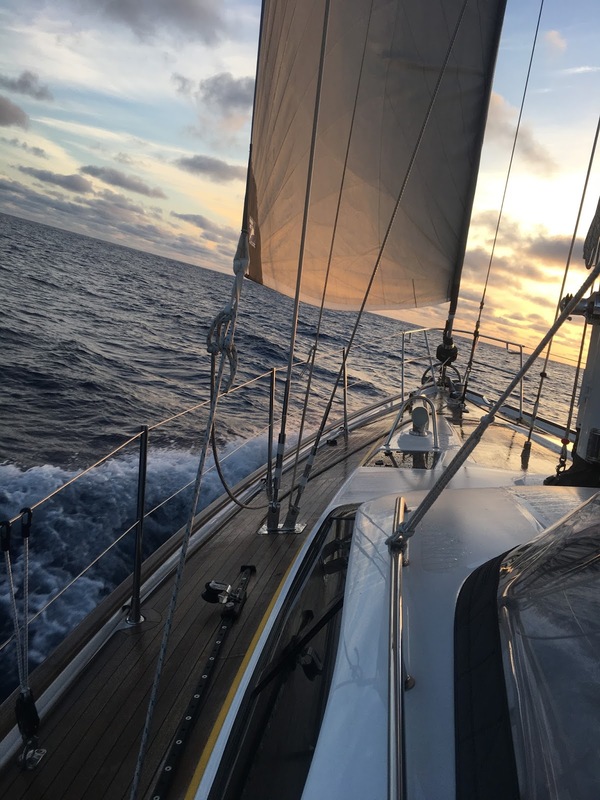 No wind and a light swell – perfect to ease us into being out of the marina and with 750 litres of fuel aboard we were not worried about a gentle motor for a few hours. The wind came in at gentle north easterly and we set the sails but it wasn’t quite enough to turn off the motor but it was a perfect day with a few light clouds and we were so excited to be out. We called the marina in Rabat, Morocco and the guy was really friendly; he said they had space for us, and that we just need to call them on the radio two miles out and they would send a pilot out to meet us and bring us in. After this Andrew relaxed into the plan and we committed to going to Morocco and we started getting really excited talking about the food and experiences we hoped to find. Just before the sun went down we saw a whale, then as it got dark the phosphorescence was amazing. 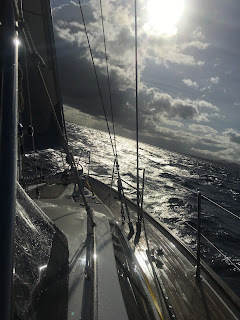 The night was really calm and we both got a bit of sleep – I maybe had a bit more than my share, but Andrew doesn’t mind if it’s only one night at sea he struggles to sleep. The next morning we both had long hot showers and ran the water maker to top up our tanks as we didn’t fancy taking on water in Morocco. Then about 1300 the visibility started to deteriorate and just got worse and worse until we could only see about 100 metres in front of the boat. At this time we only had 10 miles to go, so we called the marina on the radio to ask what the conditions were like in the harbour; the response was “it’s a little foggy, just call us when you get here and we’ll send out a pilot”. So gingerly we continued on into the fog; Andrew on the helm and look out and me inside glued to the radar and AIS shouting out any small blip with bearings and distance – it was terribly stressful as we are still getting used to these systems and many Moroccan fishing boats have no lights and are wooden so have very faint radar blips. There was a yacht already waiting and they radioed us to warn us of fishing lines on coke bottles - we headed to where they were; they just appeared out of the mist at no more than 50 metres. To our surprise it was an Australian Catamaran – Nawii. They had already been waiting a couple of hours for a pilot, the marina guy just kept saying please wait the fog will lift – so we waited and had some lunch while we considered our options. Then I called and asked if they had a forecast for the fog to lift or if they were just hoping – we’re just hoping but you can just wait!! Rule number one of sailing is always have a safe harbour to run to if you can or at least a lot of sea room. The port was closed and we were in thick fog 0.25miles off the beach. Close enough to hear the surf. We really had no intention of going anywhere else in Morocco; most harbours are small fishing ports with difficult entrances and unreliable charts so the thought of having to take Askari in to such a place was not something we really wanted to consider. 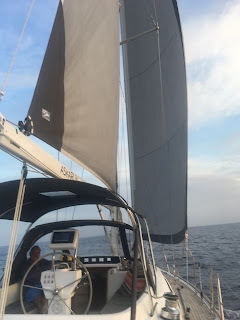 We were about 130 miles south from Barbate in Spain, however that would mean going in the wrong direction, so in the end Andrew did some fuel calculations and we decided we would make a run for the Canary Islands before the big low or it’s huge swells got too close, even though that was more than 500 miles away. We felt totally deflated and cheated as we radioed Nawii and the marina to say we were heading out. Nawii also decided to leave – I think they were going to another Moroccan Port (we hope to share a BBQ and beer with them one day soon and wish them well). Within twenty miles the fog lifted and we set a course east virtually retracing our route of yesterday before making for Lanzarote.